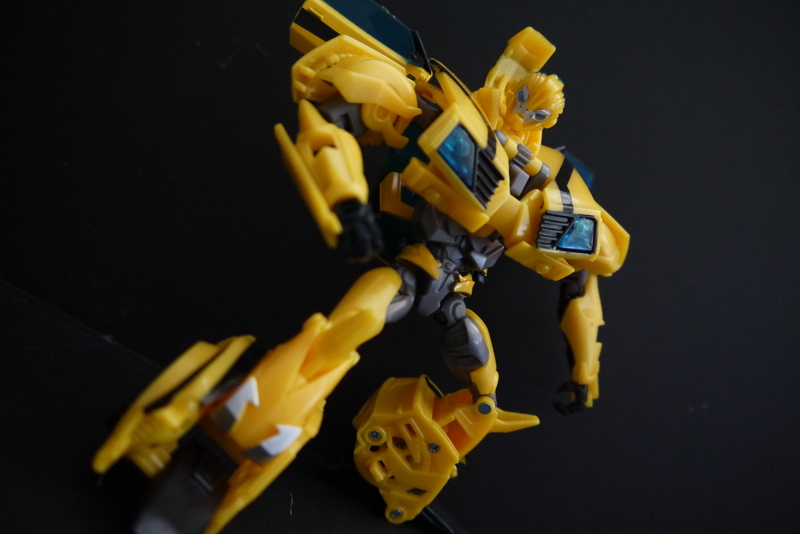 The last Transformers Prime figure I’ll be picking up; after Bumblebee I figured enough was enough, and throwing constant money at cheap mass-produced figures wouldn’t garner me much in the long run. 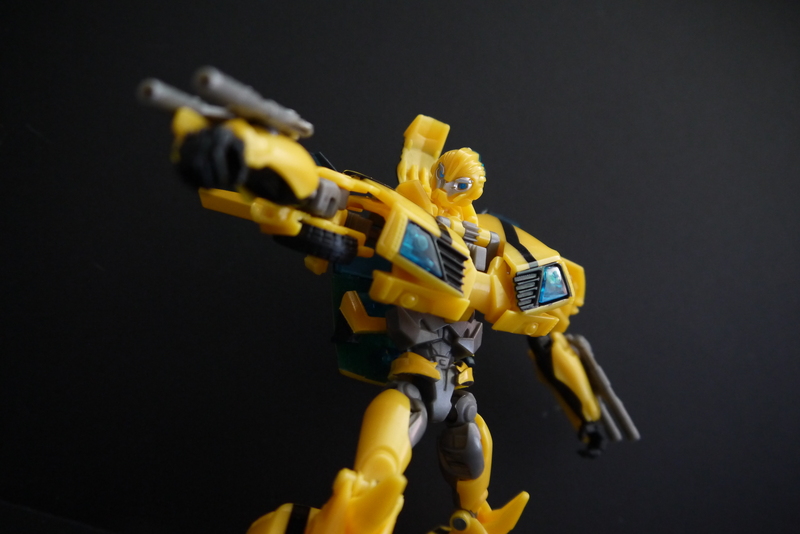 After Optimus, I didn’t bother painting either Megatron or Bumblebee. 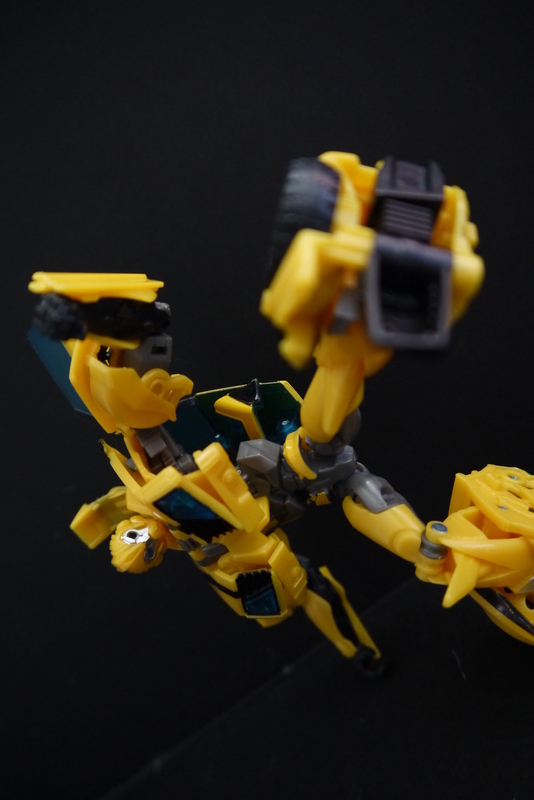 The actual robot mode itself also looks rather…funky. His body shape is too wide, compared to the compact form that he had in the series. 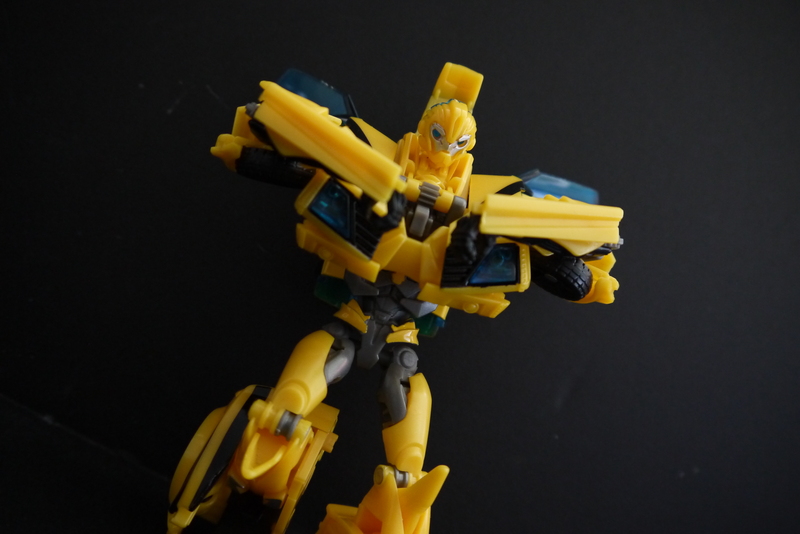 I think it’s mostly from the vehicle mode kibble all over the back. 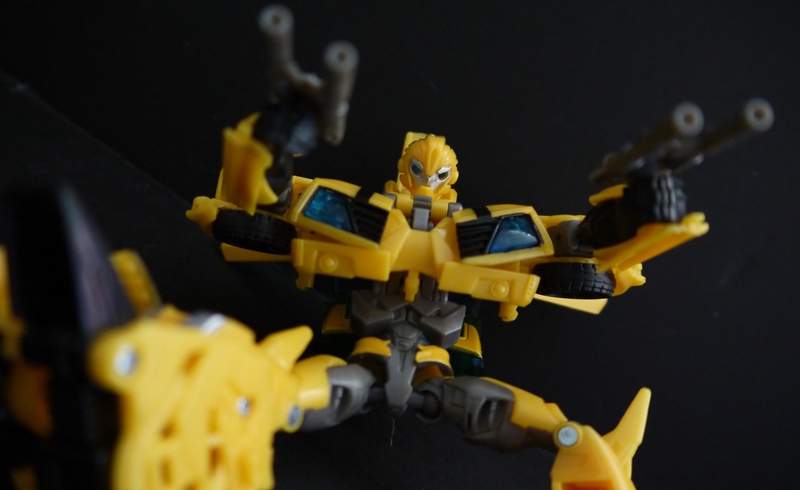 Something that bothers me a lot about the robot mode is the head section not being completely flush with the body…so looking at it from the back his head looks kind of popped up. The entire head segment is actually on a panel that forms the middle of the front hood, which doesn’t sit flush on the top of the torso. 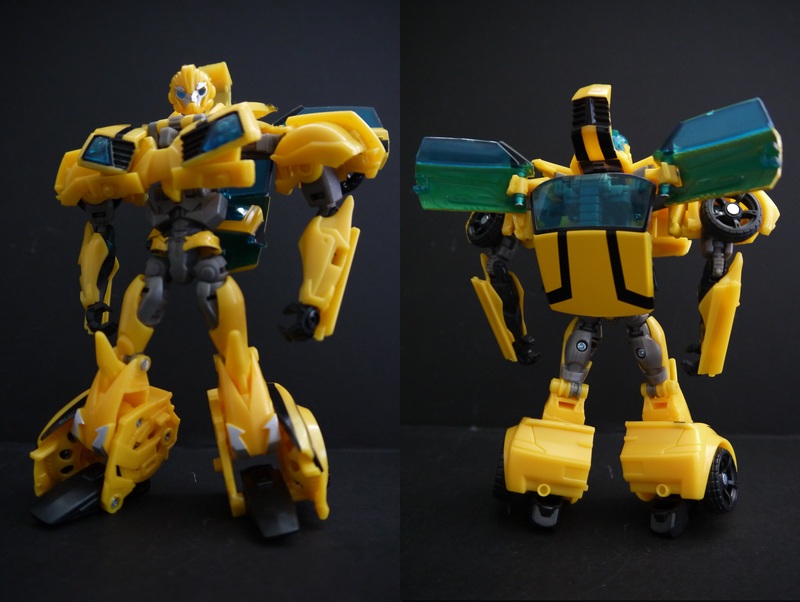 Bumblebee’s actual figure design itself isn’t too bad; while I didn’t like it at first, I’ve come to appreciate it for what it has. Simple stability and great articulation throughout where it needs to be lends it some good play value, even if it isn’t screen-accurate. I especially like the chest bit where it collapses inwards. He’s always been an agile character in-show. 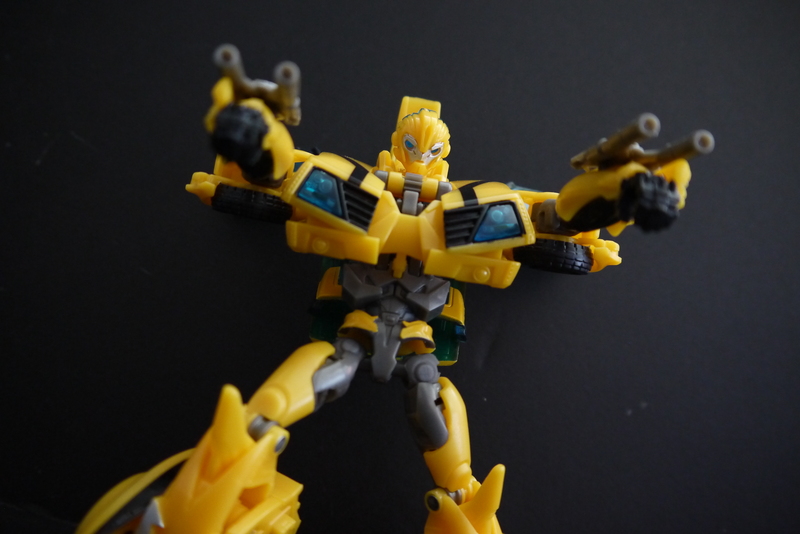 Bee comes with two small accessories, but they’re actually not bad. I like how compact and simple they are. 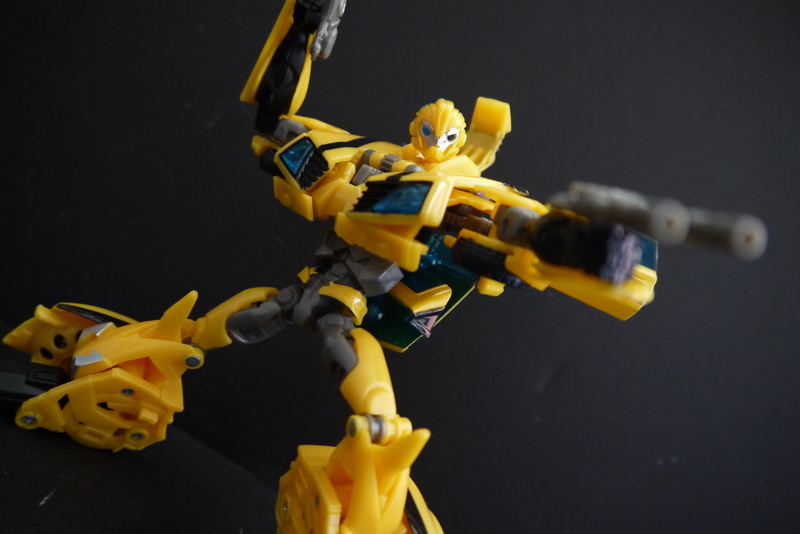 These are actually really fun to mess around with…some of the few accessories/weapons I’ve come across that really require no effort to pose with. 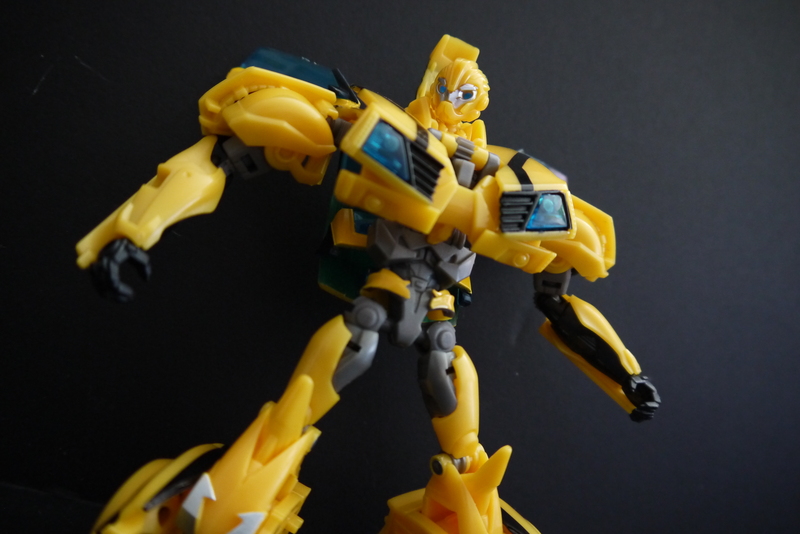 Bee, like Prime and Megatron, takes from the Bay movies and turns into a yellow muscle car of unknown make. 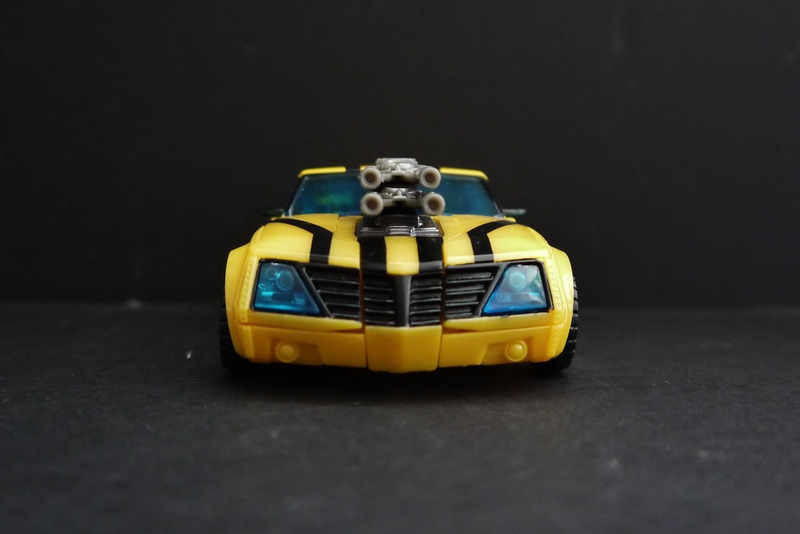 Not gonna lie, when I first saw his vehicle form, it looked really off to me, compared to what it is in the show, but then I realized it was really the overwhelming lack of painted detail. 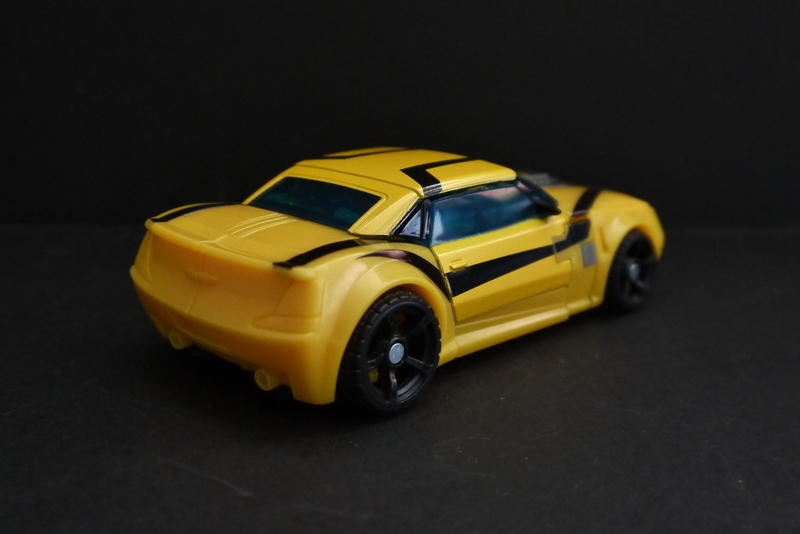 It’s all there, like the taillights and exhaust pipes, but Hasbro just keeps it all in yellow. The all black wheels are also really an eyesore. 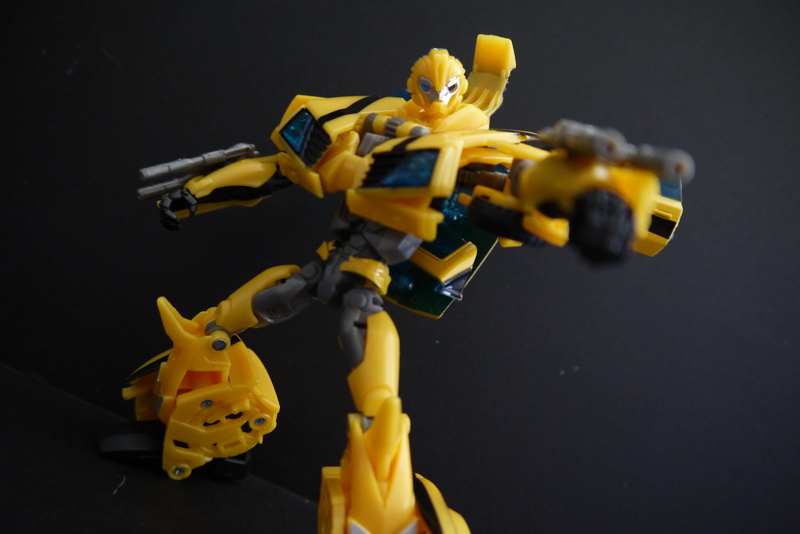 Bumblebee’s weapons are also useable in vehicle form; the cannons can attach to his engine and can be stacked. 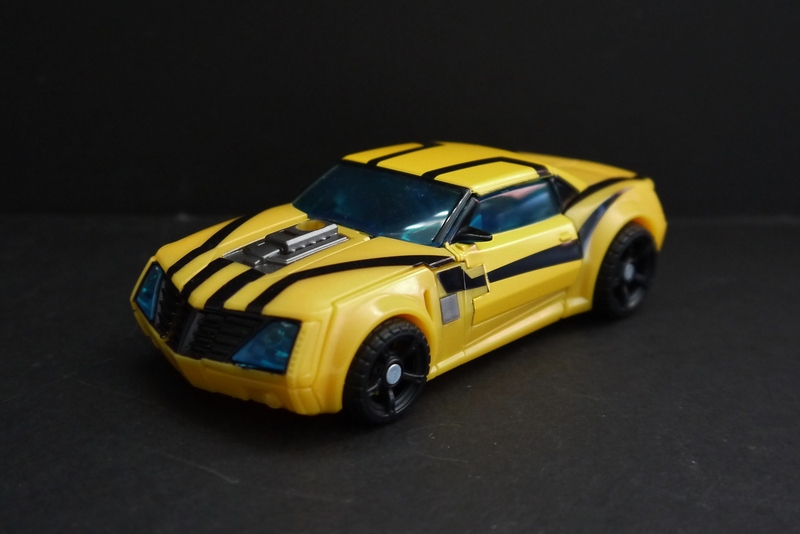 Funny thing I noted about this figure is that the doors and roof of the car form are clearly painted yellow, and not just straight yellow plastic like the rest of the car. You can see a clear discrepancy in the shades used. 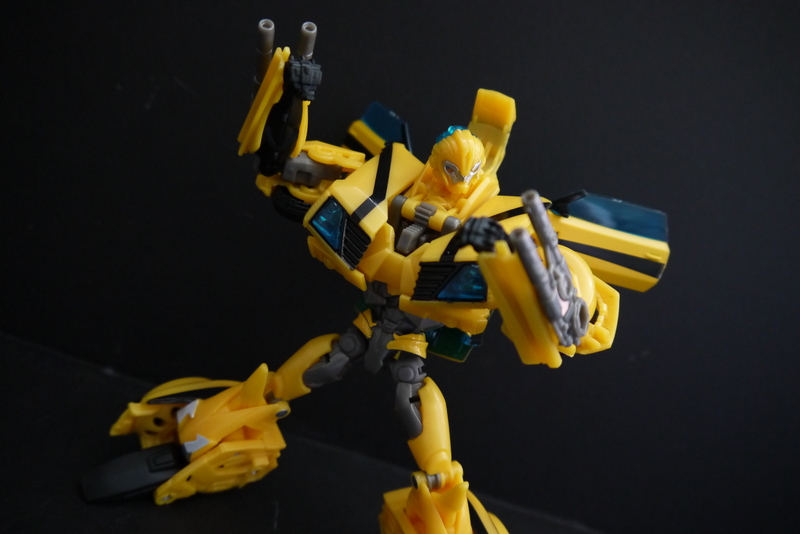 Generally Bumblebee isn’t a bad Deluxe figure, as these go. 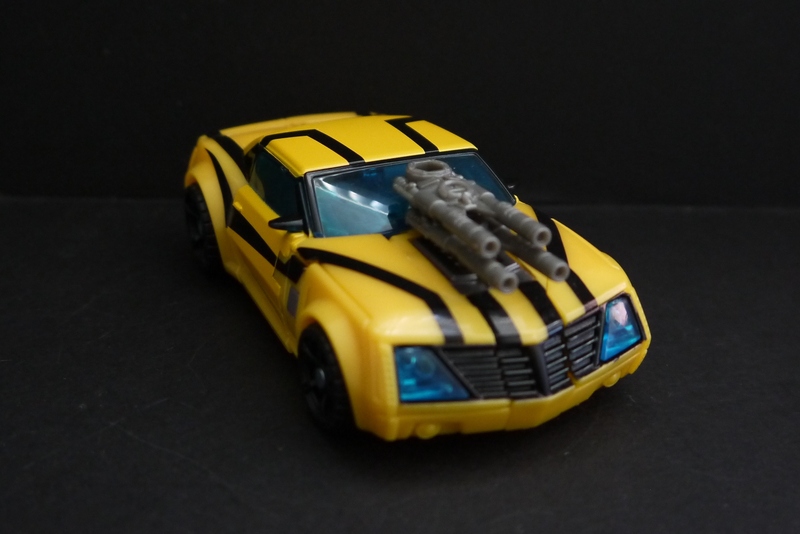 I really like how compact the vehicle form is, and I’m sure it’d look great in the entire collection of Autobot cars. However, the lack of filled in detail really irks me. The plastic isn’t ideal for paints either, since it’s a rather slippery surface, so it didn’t seem worth it to go out of my way to detail this.